The Kawai ES110 combines strong performance and a very portable weight of 12kg with an affordable price tag, making it a perfect choice for beginners with limited space, or for more experienced players looking for an instrument they can utilize in a wide range of environments. The ES110 also offers the action and sound to provide an enjoyable playing experience. The new Responsive Hammer Compact action offers improved responsiveness over the previous ES100, being based on the RHIII action from the higher-end ES8 and CN37. The main piano sound is a high-quality 88-key sample of Kawai’s EX concert grand piano, using the company’s Harmonic Imaging technology to recreate the broad dynamic range of the acoustic instrument. Those wishing to explore will enjoy the alternative piano sounds, and the creative possibilities offered by the other electric piano, organ, harpsichord, string, and pad sounds. 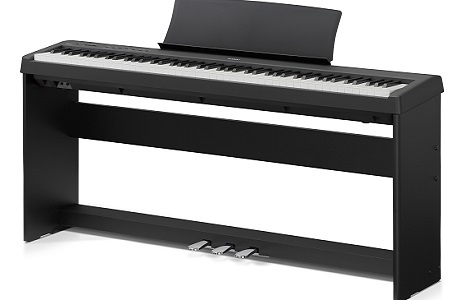 Although the ES110 doesn’t offer the USB recording functions of higher-range Kawai digitals, it does have a useful 3 song internal recorder so that you can review your playing, and Bluetooth MIDI connectivity is included. For gigging use the ES-110, with the included single pedal, will work well on a standard X-frame keyboard stand. Adding the optional HML-1 stand enables the use of the optional F-350 3-pedal unit, turning the ES-110 into a great value for money digital piano for home use.